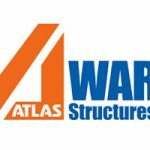 Atlas Ward is the leading design and build steelwork contractor for distribution warehouses in the UK. Atlas Ward designs, fabricates and erects structural steelwork principally for the warehouse sector. The company is also well established in the commercial, residential, health and education sectors. “ Having previously hired Hako equipment, this suggested that we should stick with Hako which was a trusted piece of kit. All the sales and demonstration processes were handled professionally, from the start of negotiations to delivery of the equipment”. The Hako Jonas 1500 fulfils all the requirements necessary to ensure many years of economic use . Its effective sweeping unit, high – performance filter system and a simple, electronically supported single – button operation make the Hako Jonas 1500 the ideal universal sweeper vehicle for industrial and commercial sweeping tasks.